Thanks for joining me today. You can read Phil Cartwright's match report here and follow the rest of the day's football action in our live text commentary. "I think when you're one on one you're hoping the keeper makes the decision for you, but he stood reasonably tall and then you just have to pick your spot. "The team have been excellent in the last few weeks so a lot of us have had to be patient but it's a long season." "We kept our shape well and stopped them making chances, but we're happy with that point. "We've really tightened up, we've kept four clean sheets in the last six games and are starting to adapt. "Credit to Hull - they're a very good team." I still fancy us this season. The weather played a massive part, especially in the first half. We've come away with a point and that is brilliant. The shares are spoiled at Ashton Gate. It was a dominant second-half performance by the league leaders Hull which resulted in a 73rd-minute equaliser from substitute Shaun Maloney. Kieran Agard's late first-half strike had put the hosts in front, but Bristol City only registered two shots on target in the whole game. Oh, that's a real chance for Sam Clucas. A deep, high cross comes in from the left, but the Hull midfielder can't get a firm connection on it with his head and it flies wide. The fourth official shows there will be four minutes of stoppage time. Enough for someone to find a winner. What an effort from Sone Aluko. Andy Robertson whips in a pinpoint cross from the left which Aluko tries to volley into the top corner, but it flashes wide. That pretty much sums up this second half for Bristol City. Luke Freeman gets into a good crossing position on the right but slips at the crucial moment and the hosts then concede a foul. Slight delay in play here as Bristol City's captain Korey Smith receives some treatment. He's back on his feet after a couple of minutes. Aluko has that little spark. He can come on and provide something different and he has a point to prove. Mark Little replaces Elliott Bennett as Bristol City make their second substitution. Meanwhile Sone Aluko comes on for Moses Odubajo for Hull. It's all Hull City now. There's a mad scramble in the Bristol City box after a corner as Curtis Davies tries to get a couple of shots away which are blocked. Desperate defending from the hosts. Jonathan Kodjia, who's been quiet in this second half, is replaced by big Aaron Wilbraham. Bristol City need some inspiration from somewhere. Can the 36-year-old striker provide it? It's all gone a bit flat inside Ashton Gate after that equaliser. If anyone is going to grab a winner, you'd have to say Hull are looking the more likely. That is a fantastic finish by the lad. He had so much time to think about it and get it wrong. He knew all along where he was going to put it. Very tidy. Hull midfielder David Meyler is out injured today. We were all waiting to see if the offside flag would go up but it didn't, and it's a terrific finish. He gave Fielding no chance. Hull are back in this and it's the substitute Shaun Maloney who's got his side back on level terms. Mohamed Diame flicks the ball through to the onrushing Scotland striker who calmly places it high into the net from 12 yards. You can't say it wasn't coming. Even though they've dropped deeper, Bristol City are putting their bodies on the line to keep this one-goal advantage. Three or four shots are blocked in quick succession and the ball is pumped downfield. Steve Cotterill is cutting a frustrated figure on the touchline. The Bristol City boss is barking at his players to get up the field. They've certainly dropped much deeper this half. Elliott Bennett is the first man to go into the book for Bristol City for tugging back Andy Robertson as he launched a run down the left. Bristol City haven't offered much of an attacking threat as we reach the midway point of this second half. I'm not sure Jonathan Kodjia has actually touched the ball after the break. Derrick Williams must be a relieved man right now. The Bristol City left-back slices his clearance into his own box, but luckily Luke Ayling is on hand to head the ball back to Frank Fielding. Akpom didn't do much today. Diame will be the one to lead the line now with Maloney in behind him. Hull make their second change of the afternoon as Chuba Akpom comes off and is replaced by Shaun Maloney. Oh, that's close. Sam Clucas picks the ball up on the edge of the area and fires a low left-footed shot towards goal which spins just wide. Bristol City are dropping deeper and deeper and look nervous. Chuba Akpom is looking a little isolated up front for Hull. The Arsenal loanee collects a long ball inside the box but has to wait an age for any support and Bristol City eventually clear their lines. What would Steve Bruce give for Abel Hernandez right now? Even though Hull have been on top for more of the game, Bristol City's defending has been superb so far this afternoon. Can they keep it up for another 35 minutes? There have been quite a few late goals involving Steve Cotterill's side this season. Moses Odubajo had to do better there. Ahmed Elmohamady's clever through-ball releases the right-back in the box, but his first touch is a bit heavy and his attempted cross goes out for a goal kick. Hull are on the front foot in the opening few minutes of this second half as they whip a couple of crosses in, but only Chuba Akpom is in the box. Tom Huddlestone needs to be a little bit careful here. The Hull midfielder, booked in the first half, fouls Luke Freeman and then has a few words with referee Paul Tierney. Probably best to keep quiet, Thomas. And it's the hosts who get us back under way. The players are back out at Ashton Gate. Hull aren't used to conceding goals, so how will their players respond in this half? Remember, the Tigers are also without their eight-goal top scorer Abel Hernandez who is being rested today. Fulham striker Moussa Dembele has won the Football League's Young Player of the Month award for October. The 19-year-old scored five goals in the month for the Championship side. France Under-20 international Dembele has been speaking to BBC Sport's Rob Stevens about the award, swapping Paris St-Germain for west London at the age of 16, and the impact of last week's attacks in the French capital. We've got a few tasty encounters coming up this afternoon in the Championship. There will be a few familiar faces at Elland Road as Rotherham boss Neil Redfearn returns to his old stomping ground, while Leeds manager Steve Evans takes on his former side. Paul Lambert's first game in charge at Blackburn sees them take on local rivals Preston. It will be interesting to see what reception Reading manager Steve Clarke gets when his team host Bolton. The Scot was in talks with Fulham about their managerial vacancy this week, but decided to stay at the Madejski Stadium. Bristol City will be happy with the first-half proceedings. Just another 45 minutes to go. I think it's just about a fair reflection of the game. It's a scrappy game and it was a scrappy goal. I think the wind is playing a big part in this. So, it's the hosts who go into break in front thanks to Kieran Agard's 39th-minute strike. Hull finished the first-half on top, but they've lost captain Michael Dawson through injury and had four players booked. They'll need a big response in the second-half if they're going to make it six Championship wins in a row. Ah, that's not great from Mohamed Diame. He steps up and bends the free-kick over the bar. Probably the last chance of this first-half. Yes it is, as the referee blows his whistle. Hull win a free-kick on the edge of the box. Lovely feet from Mohamed Diame as he's brought down by Marlon Pack. There will be four minutes of stoppage time at the end of this first-half. More defending for Bristol City to do as the visitors win a corner. That was a great chance and I'd have to assume that Akpom just couldn't quite see it because if he'd connected with that then that's a goal. Another chance for Hull who are finishing this half on top. Andy Robertson sends in a cross from the left, but Chuba Akpom can't get on the end of it. Steve Cotterill will be desperate for his side to see out the remaining couple of minutes in this first-half. Elliott Bennett produces a magnificent headed clearance to keep Bristol City in front. Jake Livermore sends the sweetest of strikes towards the top left-hand corner, but Bennett heads over the bar for a corner. Big, big moment in this game. It's one of the scrappiest goals you will see, but Bristol City don't care! Luke Freeman sends in a lovely free-kick from the right, the ball bobbles around in the box and Kieran Agard is on hand to smash the ball into the back of the net. Poor defending from Hull. It's the first league goal they've conceded since 17 October. This is all a bit ragged from Hull. Andy Robertson hacks down Elliott Bennett on the right-hand side of the box. Dawson looks to have pulled his hamstring in making that challenge. He's passed the armband to Tom Huddlestone. The resulting free-kick comes to nothing as Luke Freeman's ball in drifts straight out for a goal kick. That was poor from the midfielder. Bristol City win a free-kick on the edge of the box as Michael Dawson clatters into the back of Jonathan Kodjia. 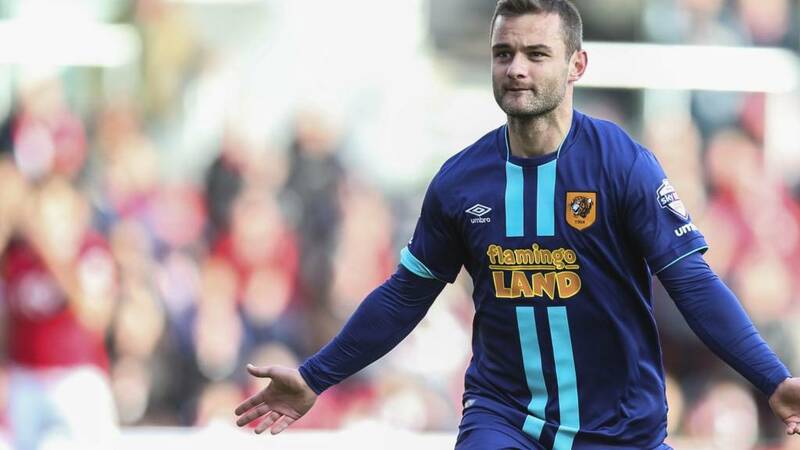 It's the Hull skipper's fifth booking of the season which means he'll miss their next game. Dawson also looks to have injured himself while making the challenge and is receiving some treatment. In fact he's going off and is replaced by Curtis Davis. Memphis Depay has put Manchester United 1-0 up at Watford in today's early Premier League fixture. Follow live text commentary of the match at Vicarage Road here. That's the best chance of the game so far and it's come from Hull centre-back Harry Maguire. He finds some room on the edge of the area and powers a shot towards goal which is tipped over by Frank Fielding. In fairness it was straight at him, but still needed dealing with. There's a bit of confusion between Frank Fielding and Derrick Williams as both think each other is going to deal with the ball in the Bristol City box. They don't realise Moses Odubajo is closing in, but luckily for the hosts, the Hull right-back trips Williams while trying to get the ball. Ah, this is slightly concerning for Bristol City. Jonathan Kodjia is down for a moment after clashing knees with Michael Dawson. However, he's back up and running shortly after, but it looked a sore one for the striker. Bristol City do not want to lose Jonathan Kodjia, with the form he's been in. Tom Huddlestone becomes the second Hull player to go into the referee's notebook. Kieran Agard breaks, but the former Tottenham man brings him down with a fairly cynical sliding challenge. That is some wonderful vision from Derrick Williams. The Bristol City left-back curls in a beautiful low cross which just evades Kieran Agard at the far post. I think it's fair to say the hosts have just shaded the opening 20 minutes. First chance for Hull City. Mohamed Diame finds some space in the box and shoots, but it's brilliantly blocked by Luke Ayling and spins out for a corner. The corner eventually comes out to Michael Dawson but the centre-back scuffs his shot over the bar. That was definitely a defender's effort! The players are showing the divot that's been taken up inside the line. I think it was probably just outside the area, but it was as cynical as you like and worthy of a yellow card. Harry Maguire is a very lucky boy. The Hull defender gets the wrong side of Elliott Bennett and brings down the right back just outside the box. Referee Paul Tierney shows him a yellow card. Luke Freeman fires in the resulting free kick which Allan McGregor tips over the bar. It's a fairly scrappy start from both sides and, on a freezing cold day, it might take a while for this game to warm up after the international break. Hull have nine clean sheets in 16 league games this season and you can see why. Bristol City win a free-kick on the left-hand side of the box after Jake Livermore brings down the lively Jonathan Kodjia. The ball is whipped in and eventually cleared after a couple of attempts by the Hull defence. The sun does appear to be causing a few problems for the Hull players. It looks horrible out there to be honest. I'll have to give the defenders the benefit of the doubt because the wind is really swirling about. The first chance falls to Bristol City and their top scorer Jonathan Kodjia. Luke Freeman picks the Frenchman out with a wonderful ball over the top and Kodjia launches a fierce strike at goal which flies just over. Decent opportunity for the hosts. It's the coldest I've known it. I'm holding onto my teamsheet for dear life so that it doesn't blow onto the pitch. It's certainly wintertime now. The low sun seems to be causing Hull goalkeeper Allan McGregor a few problems. Bristol City win a free-kick on the right hand side, but it drifts harmlessly out for a goal kick. It was a perfectly observed minute's silence at Ashton Gate. It's the visitors who get us under way on a crisp and cold afternoon in the West Country. Before the game gets under way, we're going to have a minute's silence to remember the 130 victims of last Friday's Paris attacks. Bristol City striker Jonathan Kodjia was in the French capital visiting family while the incident unfolded, but was at home at the time. He starts today, but obviously a very difficult week for the 26-year-old who was born in Saint-Denis where some of the attacks took place. If you're able to receive BBC Radio Bristol or BBC Radio Humberside on your radio, you'll be able to listen to live commentary of today's match at Ashton Gate. Unfortunately a rights issue means we're unable to stream Football League commentaries on the BBC Sport website. You can, however, listen to the pre-match build-up on both stations by clicking on the Live Coverage tab. Substitutes: Jakupovic, Bruce, Taylor, Davies, Maloney, Hayden, Aluko. Bristol City boss Steve Cotterill has named an unchanged line-up from the goalless draw at Bolton a fortnight ago. Substitutes: O'Leary, Bryan, Moore, Little, Reid, Cox, Wilbraham. We'd like you to be part of today's live text commentary. Can Hull can make an immediate return to the Premier League? Do Bristol City have enough quality to stay in the second tier or are they too reliant on Jonathan Kodjia? Let us know your thoughts on the game using #bbcfootball on Twitter. Bristol City on the up? Things are looking slightly rosier for today's hosts Bristol City, who were bottom of the Championship following the last international period at the start of October. Since then, two wins and two draws from their last six matches, have seen Steve Cotterill's side move out of the relegation zone into 20th place. Defeat today, however, could send them back into the bottom three if other results go against them. The Championship table has made pretty reading for Hull fans over the last fortnight. Brighton may still be the only side with an unbeaten record in all four divisions, but five straight wins for the Tigers without conceding a goal has propelled them to the summit. Can they make it six in a row today, against a Bristol City side who have found a bit of form in recent weeks? It's certainly been a difficult couple of weeks where football has taken something of a back-seat during the international break. Today, our domestic game will get its chance to remember the victims of last week's Paris attacks. We start at Ashton Gate where Bristol City take on Championship leaders Hull City. Kick-off is about 20 minutes away.